In music, unison represents two or more musical parts sounding the same pitch or at an octave interval, usually at the same time. Rhythmic patterns which are homorhythmic are also called unison. What’s more, the chorus is a widely used effect for making vocals and various instruments sound wide. However, in this tutorial, I will demonstrate how a unison effect can achieve even better results. For this tutorial, I have chosen the MUnison plugin by Melda Productions. It is a rather complex plugin with lots of possibilities and features. Its advantages are primarily voice doubling, a fully automated real-time harmony voice generation and the ability to create huge ensembles from single voices. MUnison does all of that in pristine quality while delivering great natural sound. It features up to 50 voices up to an octave pitch shift up or down, independent formants and pitch control and much more. So, here is a simple synth sequence made in SoundBridge. Let’s hear how it sounds. It sounds ok but rather average and it lacks some power. Let’s fix that by dropping a new instance of MUnison on the synth sequence MIDI channel. After opening MUnison interface we can see a lot of parameters available to control. In the top part, there is a “Globals“ panel with the main parameters from which I will explain the most used ones. 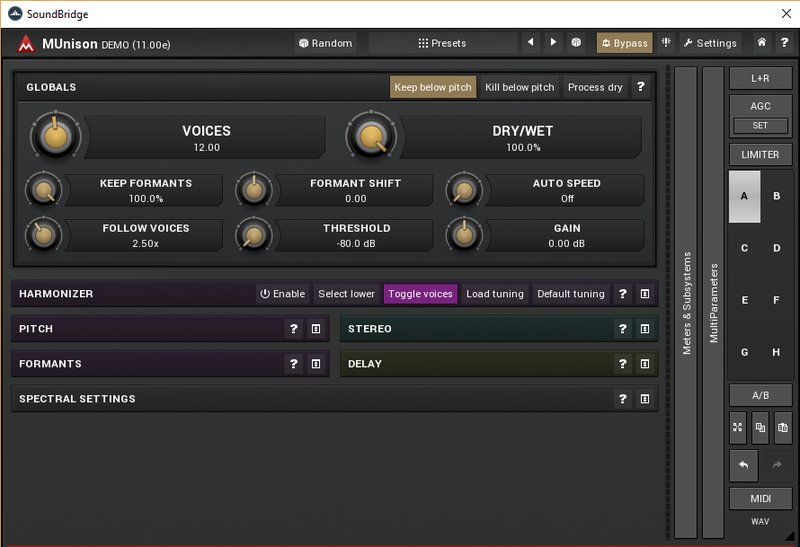 Controls the number of artificial voices that the plugin creates. The higher the number, the more CPU power the plugin requires of course. If Follow voices switch is enabled, changing voices also vary other parameters in the background to make the sound character appropriate. Lets you manually alter the formant information (in semitones). This generally results in no pitch shifting, but can create the mickey-mouse effect for example. Controls how much certain parameters follow the number of voices. The purpose of the plugin is to create artificial voices that sound similar to the original (unless harmonized), yet sort of different, so that the human brain recognizes them as separate voices. It does that by detuning them, changing the formants etc. However, these values usually need to be different for a different number of voices. For example, if you have just 4 voices, they all need to be fairly in tune, otherwise one would say that some of them sing really badly. But if you have 40 voices, which are all in tune, they could just sound too similar. You can then compensate for that by increasing the pitching depth or let the plugin do that for you automatically. For the synth sequence above I increased voices up to 12, moved dry/wet parameter all the way to maximum and set the keep formants parameter to 100 %. Firstly, let’s hear how the synth sequence sounds like this and after I will automate the formant shift parameter to achieve an even wider sound. Since this plugin is really complex, in one of the next blogs I will dedicate more attention to its more advanced features like built-in harmonizer and modulation possibilities.